Only confirmed members are entitled to use “Member of the International Dance Council CID” after their name on their stationery, visiting card, school entrance, brochures, website. Check your listing in the Who's Who in Dance global directory: www.cid-portal.org Send addresses to enrich the Directory. Visit regularly our portal, it is constantly updated, so are the sites of CID Sections. You are encouraged to nominate worthy persons, schools or companies for CID membership. Once there are enough members in your area you can found a CID Section. Send membership fee in December every year to continue being a CID Member. Membership fees are the only source of income of CID, since it refuses subsidies or sponsorships in order to preserve its independence. Take part in CID programs, as well as in meetings and activities of CID members. Prepare activities in your country and common projects with other countries. Join the local CID Section. Forward news from CID to your colleagues and to the press. Write articles, give interviews, maintain contact with journalists. Prepare your trip to the next General Assembly (every two years), a World Dance Congress www.orchesis-portal.org/cdr/ or another CID event. Prepare activities for the celebration of World Dance Day (29 April). Send the official annual message to journalists. Verify that our messages are not blocked by your antivirus or by the filters of your Internet provider. To ensure you receive our messages add ExecSec@cid-portal.org to your address book. Check that our messages are not sent to the Junk folder. Once a month we send the CID Circular. If you do not hear from us send fax. Wear your CID badge at all times; we are all proud to belong to the great family of dancers of the world. 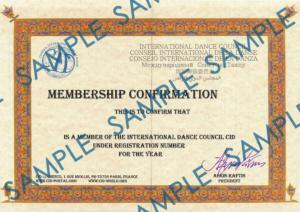 Print visiting card bearing title after your name: "Member of the International Dance Council CID". If you have authored or edited books or DVDs, ask for them to be included in the CID Virtual Library. Send your printed or digital books, magazines and articles for the portal. Type your name and registration number in the Subject Line of email messages to facilitate processing. We have a professional secretariat working two shifts a day, seven days a week, to reply to messages in many languages - help them identify you and assist you. Before travelling to another country contact CID Members there. They will brief you on the situation, provide assistance and put you in the dance picture. CID is also a vast network of select professionals, a huge family - use it. You can offer International Certification to your students.